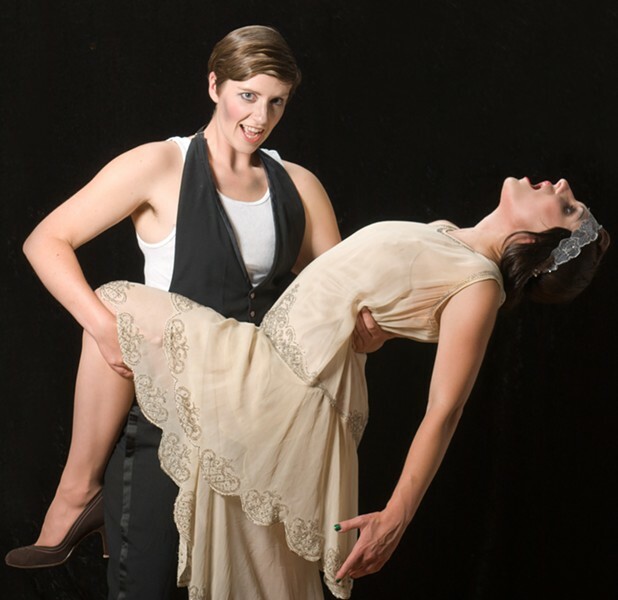 Kelsey MacIlvaine as the Emcee and Elena Tessler as Sally Bowles in Ferndale Rep’s Cabaret. Their relationships with each other and several other characters are the principal focus of the first act of the musical Cabaret, as produced at Ferndale Repertory Theatre. But the realities of a country moving toward Nazi rule intrude in the much shorter Act II. Elena Tessler's vitality, her strong and supple voice, are again evident, though the role of Sally Bowles is less prominent on stage than in the Liza Minnelli movie. MacIlvaine is energetic and magnetic, Heinberg is winsome, Robison and Wilkerson are charming and convincing. Among the capable supporting cast, Caitlin McMurtry is again incandescent. The band is especially important and especially good. Additional cast members are Jeremy Webb, Jessie Shieman, Linnea Hill, Julia Giardino, Zoey Berman, Dante Gelormino, Qaiel Peltier, Jeffrey Ray Kieser and Jaison Chand. The orchestra is Dianne Zuleger, Justin Ross, Tamaras Abrams, Stephanie Douglass, Michael Lewis, Gina Piazza, Amber Grimes, Monica Dekat and John Petricca. Director Ginger Gene, musical director Dianne Zuleger and choreographer Linda Maxwell have constructed a fluid production, while lighting by Liz Uhazy and costumes by Erica Fromdahl match the moods. The songs are by the team of Fred Ebb and John Kander, who later wrote the songs for Chicago. The sexuality it portrayed was still scandalous when Cabaret became a Broadway sensation in 1966, and there were many who remembered the actual 1930s (in fact, the original cast included Lotte Lenya, famous for singing in Brecht and Kurt Weil productions in Berlin at the time this musical is set). The original production (and the 1972 film) emphasized the grotesque elements of this Berlin with theatrical techniques new to Broadway. But today in Humboldt County, nothing much of the show's sexuality is unfamiliar, let alone shocking. The textures of those times and that place -- even as then known through media filters -- are mostly remote, replaced by a few symbols and images. So this show could now be considered a cautionary tale about the peril of ignoring political dangers. Or it could be seen as sentimentalizing a complexly horrible time, while approximating a style that has lost its edge. Or you can see it as both, which is pretty much my view. Cabaret resumes its run at Ferndale Rep Fridays and Saturdays at 8 p.m. July 27-28, and again on Aug. 10-11 and 24-25, with Sunday matinees on July 29, Aug. 12 and 26. In roughly the same period that Cabaret takes place, the Great Depression was taking hold in the U.S. just as an ecological disaster called the Dust Bowl was driving thousands of already poor farmers from Oklahoma and other states, principally to California. An itinerant self-taught musician named Woody Guthrie joined their journey and wrote songs about the experience. Five of those songs, collected on Guthrie's first commercial album, are among the 19 featured in Woody Guthrie's American Song, the show that alternates with Cabaret this summer at Ferndale Rep.
Woody Guthrie collected folk melodies and chronicled the 1930s and '40s, "from California to the New York island" (as his famous song says). Some of his songs (like "This Land is Your Land") are so ubiquitous that many listeners today probably don't know he is their author. Those old enough to remember the folk revival of the '60s (and the smaller '90s revival) are likely to recall songs like "Bound for Glory," "Pastures of Plenty" and "Hard Travelin'" as done by Peter, Paul and Mary, The Kingston Trio, Pete Seeger or by Woody's son, Arlo Guthrie, or more recently by Bruce Springsteen. Guthrie's songs do reflect America but not in a generic way, and their relevance recurs in our time. Just as Cabaret may remind us that beyond the repugnant noise of politics truly dangerous forces may be on the march, Guthrie's lyrics reveal the human costs incurred by the rich exploiting the rest, masked by the smiley face of fake patriotism. That songs like "Union Maid" and "Deportee" (both in this show) are again topical in 2012 should be the real shock. Members of the ensemble performing these songs at Ferndale Rep are Devin Galdieri, Jo Kuzelka, Steve Nobles, Dianne Zuleger, Jeremy Webb, KJ Jusefczyk and Roger Vernon. Pete Zuleger, Val Leone and Larry Hudspeth are the accompanying band. Woody Guthrie's American Song is directed by Dianne Zuleger, with lighting design and technical direction by Liz Uhazy. It plays Fridays and Saturdays at 8 p.m. on July 20-21, Aug. 3-4 and 17-18, with Sunday matinees on July 22, Aug. 5 and 19. Elsewhere: The Rangeelay Theatre Ensemble's IN' Tents: A Conservation Comedy in the Great Outdoors plays Thursday, July 19, at 8:30 p.m. at the Elk Prairie Campground in Prairie Creek Redwoods State Park. This is a collaboration by several actors from Dell'Arte, Meghan Frank and Pratik Motwani, who produced the death and dying rumination, Exit 101, and director Janessa Johnsrude, who was in the cast of Mary Jane: The Musical (as was Motwani). Their Chaplin-esque educational comedy details the misadventures of first-time camper Chipotle (Motwani) who is schooled by park ranger Patricia Pinky (Frank) on how to camp out without messing up our natural spaces. After a local run, including a show Friday, July 20, at Jedediah Smith Campground, the show goes national with stagings in Yosemite, Grand Canyon and Rocky Mountain national parks. More details at intents.snappages.com. Coming Up: On July 26, North Coast Repertory Theatre opens the comedy The Red Velvet Cake War.